Have you had a chance to try Althea Milk Peel Cream Mask? This Milk Peel Cream Mask is a bubble mask actually. It’s also fast working which recommended to keep on the face for 30 to 60 second. I’ve had it for a few months now and also been trying it enough to understand it properly s far. But this 60-second timing is just going over my head. When it’s a mask, bubble mask or whatever else, I need time with it. Previously fastest masking time, 2 minute, I encountered with FOREO UFO Smart Mask even which I like to repeat for a couple of session! Water (Aqua), Kaolin, Glycerin, Disiloxane, Bentonite, Propanediol, Myristic Acid, Methyl Perfluoroisobutyl Ether, Stearic Acid, Methyl Perfluorobutyl Ether, Potassium Hydroxide, 1,2-Hexanediol, Palmitic Acid , Ethylhexyl Glycerin, Milk Protein Extract, Disodium Edta, Gaultheria Procumbens (Wintergreen) Leaf Extract, Gluconolactone, Glycolic Acid, Titanium dioxide (Ci 77891), Fragrance (Parfum), Coumarin, Hexyl Cinnamal, and Citronellol. 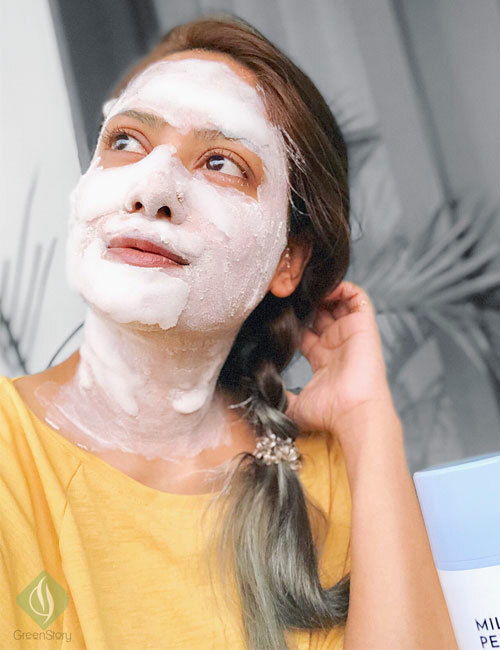 How Althea Milk Peel Mask Works? This clay-based mask activates with water. When you massage the mask with water or in a damp skin it bubbles up. Unlike other bubble masks, [e.g. Mamonde Bubble Mask or such] Althea Milk Peel doesn’t really bubble up right away when dispensed out from the bottle. The more you massage the more the mask bubbles up. I like playing with this bubble mask so I could never stop in instructed 30-60 seconds but I go along with my mood-timing. The bubbles this mask creates is also very fine which I kinda like. However, in my opinion, this fine bubble is nothing smooth like whipped cream as said by Althea Korea. Contained AHA and BHA properties of Milk Peel Mask works work to give the skin a gentle exfoliation. Also the milk protein suppose to give a nourishing feeling after each use. After my generous time of using this Althea exfoliating bubble mask I actually failed to under the naming reason of it. The mask initially doesn’t even smell like milk but those budget baby powders. 30-60 second of use give me a feeling that I’m using a bubble cleanser, straightforward. If I take it as a cleanser then Milk Peel fails on the term it won’t work over my makeup. I can’t only take it as a 2nd or 3rd time cleaning. Which is why my best found time of using this mask is at night after cleansing ritual and before my sheet masking session. Yes Althea Milk Peel does gives a refreshing feeling after the use but my combination skin seeks for hydration. Considering this fact I will say it’s not moisturizing like milk. At least for my skin! I like to follow up this mask with a sheet mask every time. Don’t ask me… but if you’ve used it then you tell me… Why exactly this mask calls a ‘Cream Mask’?! This Milk Peel mask has no characteristic of a cream mask formulation. For the most common fact, a cream mask will soothe irritated skin. Whereas Althea Milk Peel is an exfoliating [kinda-mm-sorta; turned out too gentle to notice anything for me] mask!!! … It bubbles up after all! let me know if you agree/disagree with me in the comments below. Is this Althea exfoliating mask works on skin brightening? I’ve discussed the mask with a few of my friends who have been using this mask as well. Some of them found this mask brightening. Which I disagree with! It’s refreshing and skin feels clean but I think the AHA/BHA exfoliating effect is too gentle to give a visible brightening effect. Well, it might! In case if you’ve never used (or not using) any acids/other exfoliating skincare items in your skincare routine. I’m obviously must on retinol and other acids in my skincare regimen. Not to forget me on my 30’s and I do care for aging! I assume for young skin or those who have sensitive skin Althea Milk Peel can come handy. Available to purchase online at Althea Korea. If you have tried Althea Milk Peel Bubble Mask (AKA Cream Mask) how you feel about it? Do you feel satisfied with the outcome? Do you feel the exfoliating effect is enough for you? Are you tussled up with the name of this mask like me? Share your thoughts. Your opinion matters to me and all the readers of GreenStory.